-The main message of my poster is that gun violence has to stop. -I chose to use that font because it looked really cool. I chose the broken heart picture because gun violence brings sadness to the friends and family of the victims. I chose the turquoise background because it made the heart stand out. -At first, my poster was just some words in the middle of the poster. Then, I added the broken heart because that symbol goes well with my topic. After that, I moved the words to the top and bottom of the heart because there was a lot of space underneath. ​-I think the most successful part of my poster was drawing the broken heart. I think that I could have filled up the space with more pictures or text. I could have also used a background that fits the theme a little better, even though it helps the heart stand out. 3) For my poster, I started by... then I changed... color added.. the issue.. because..
My name is Sophia. I am a 7th grader in Chute Media Arts. I made my poster about gun violence. I chose this message because innocent people are getting hurt and killed because of guns. 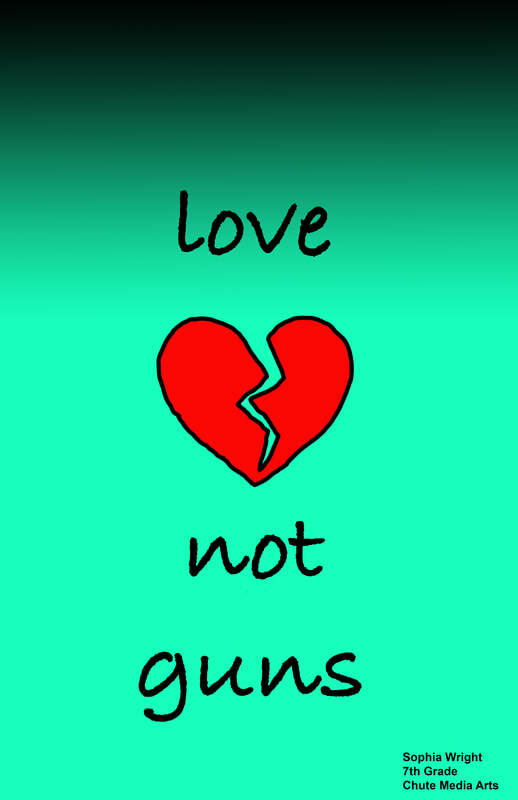 ​in my poster, I chose to have a broken heart to symbolize sadness for the victims' friends and families. I chose the turquoise background to make the heart pop. for my poster, I started by finding a cool font. then, I made the background turquoise because of the heart. then, I added the words and the heart pic. I still needed to color the heart, so I made a black outline and filled the rest in red. then, I moved the words so it looked better. this is my frame in photoshop. my theme is acting, so I wanted to make it look like a stage with LED lights pointing at the picture from the stage lights on top. this is my frame cut out. I used adobe illistrator and easel to make my frame cut. I used the laser cutter to cut it out. I wanted LED lights to shine on the picture, so I had to cut out holes. I used the carvey to try and make holes where the lights were. when I used the carvey, it didn't cut in the right place and I had to find a different way to cut the holes. luckily, Ms. Kushner had a drill I could use. 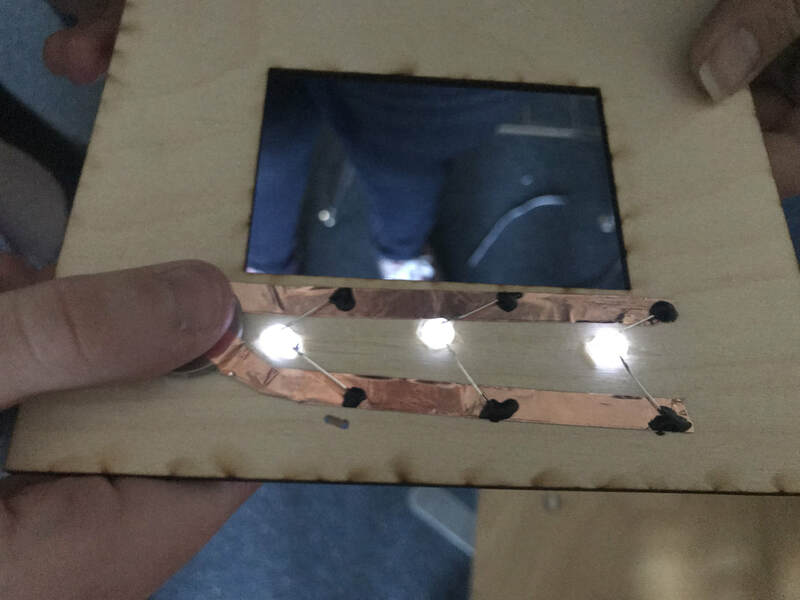 once the holes were cut, the lights fit perfectly. then, I had to make the lights light up. 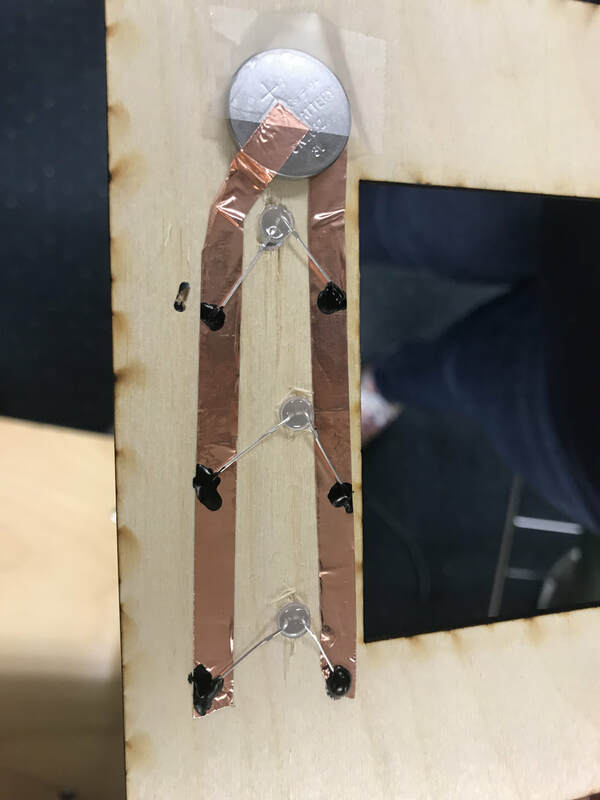 ​I used a parallel track to let the positive side and the negative side both bend onto the copper tape. I wanted to have a switch, so I added more copper tape and a brad with conductive tape on the tip so the battery would work when I pressed the switch on the battery. then, I needed a stand to hold the picture frame upright. I made it out of two pieces of wood and wood glue. I cut a strip of wood to keep the picture frame in place when I put it on the stand. this is my completed stand! 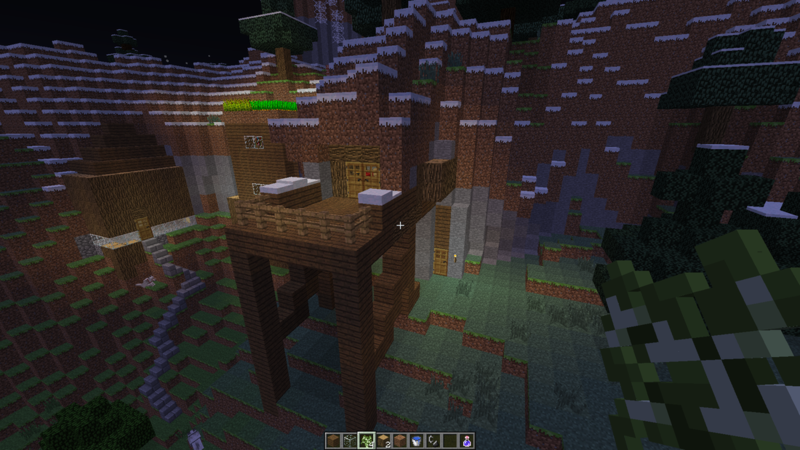 I am working on making a small Minecraft village on the side of a mountain. 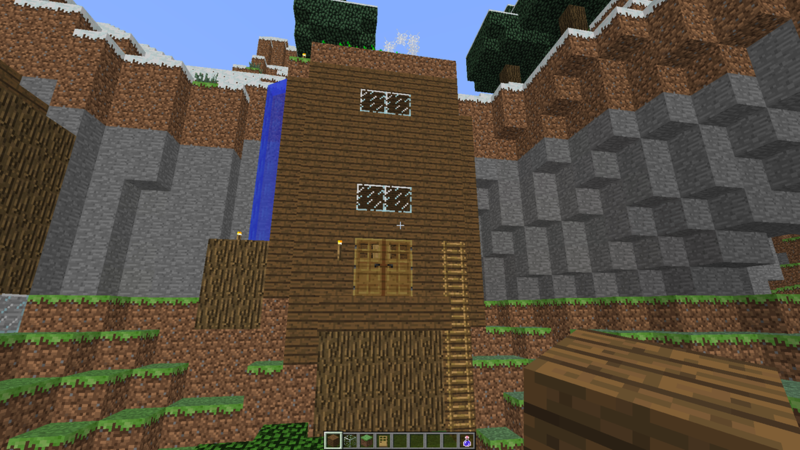 this is the first house I built. there is a garden on top with wheat, carrots, and potatoes. there was some trouble with the irrigation of the garden because it was up high in the mountain and the water froze a lot and I always had to break the ice. so, I put torches all along the water and now the water doesn't freeze as much. this is my second house. 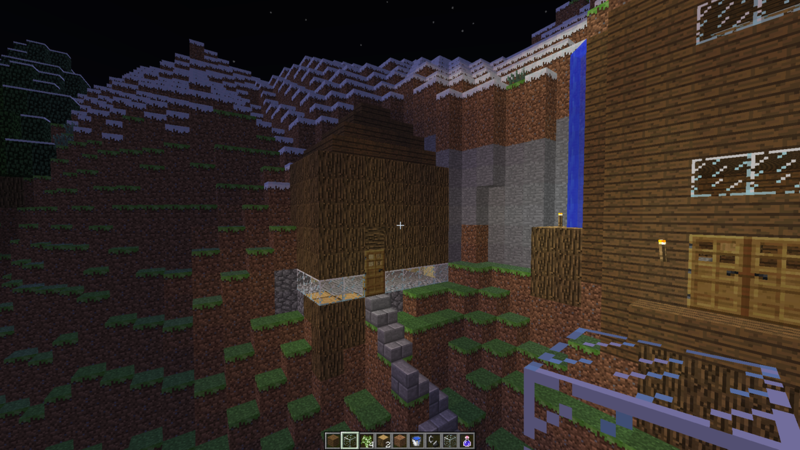 it goes very deep into the mountains with lots of rooms and storage space. there is also a small second floor with bookshelves and a couch made of wood stairs.